You’re not just selling a house, you’re selling a home. Follow these simple home-staging tips to showcase your property’s strengths and create a living space that will appeal to the broadest range of potential homebuyers. First impressions do matter. Presenting a clean, well-maintained property is a surefire way to make a positive impact on potential buyers. Homeowners can become noseblind to the smells in their own homes. Musty carpets, unpleasant pet odors and the lingering smells from last week’s fish fry may not be noticeable to you, but they are to new visitors. Deodorize, sanitize, and if necessary, replace anything that could be contributing to this problem. Encourage buyers to envision your house as their home. Remove the photos, keepsakes and personal clutter that can make it difficult for them to see the best of what your property has to offer. Repurpose that junk room into a peaceful meditation space or a cozy reading nook. Inexpensive light fixtures, eclectic furnishings and a bit of creativity can transform an unused room into a sought after amenity. Homebuyers are attracted to light and airy spaces. Brighten dark and dingy rooms with open window shades, light colored paint, and plenty of lamps and light fixtures. A new coat of paint is among the easiest and least expensive ways to add value to your home. But be careful– choosing the right color can be tricky. 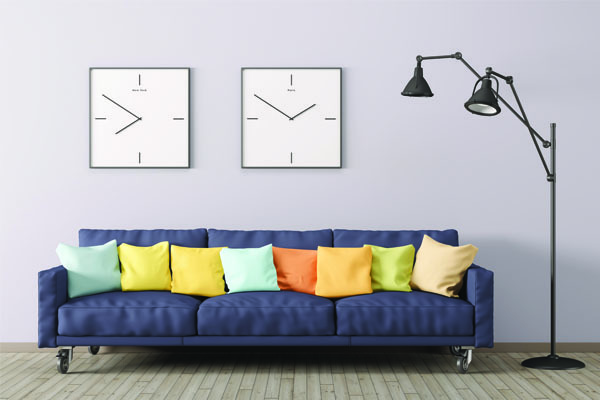 A primarily neutral palette with a few pops of vibrant accent color might be all you need to freshen things up while still allowing buyers to focus on the real star of the show- your home itself. To achieve maximum decor with mininmum effort, accessorize in groups of three. A triangular arrangement is generally considered most appealing to the eye. Variety can add charm, but visual balance is important – size, texture and color of grouped items should be considered. Position furniture away from walls. Arrange sofas and chairs into cozy conversation groupings. Design rooms to compliment the architectural features of your home and encourage good traffic flow in, out, and through the space.